Nylon headband or elastic to attach bow to. Do not chain one to begin a new round. About an hour to make the bow. Please allow AT LEAST 24 hours for the paint to dry before tying the bow together. 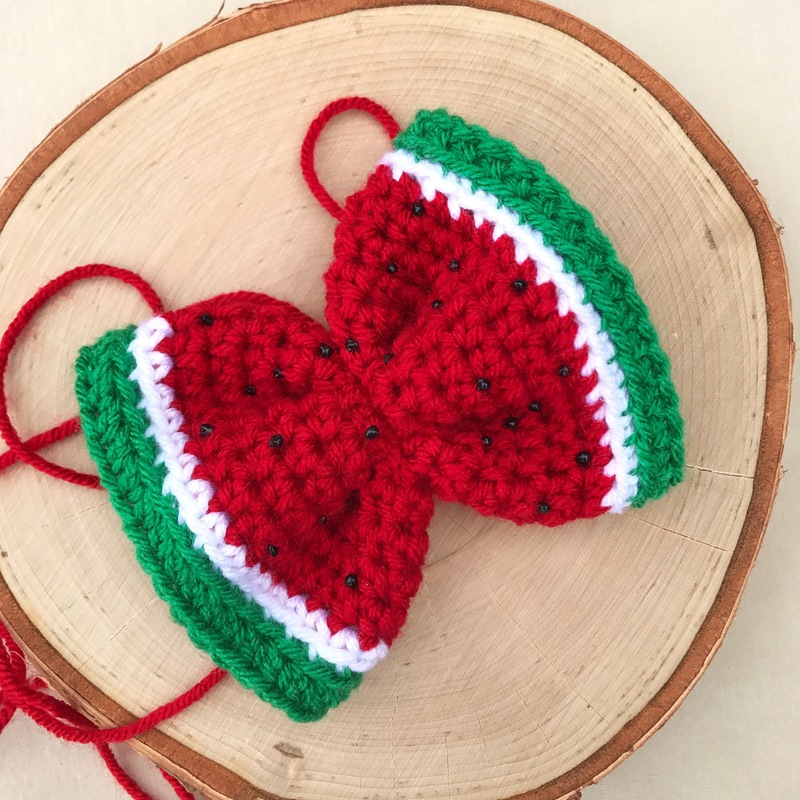 If you tie the bow together before the paint is fully dry, it may ruin the crochet. Slip stitch into 1st chain stitch to make a circle. We will be working in a continuous round. Do not chain one before going into the first stitch. Round 1: Using GREEN yarn, complete one round of HDC, 30 stitches. Round 2: Using WHITE yarn, complete one round of SC, BLO (back loop only). Round 3: Using RED or PINK yarn, complete one round of HDC, BLO (back loop only). Rounds 4-14: Using RED or PINK yarn, crochet 10 rounds of HDC, 30 stitches per round. Round 15: Using WHITE yarn, complete one round of SC. 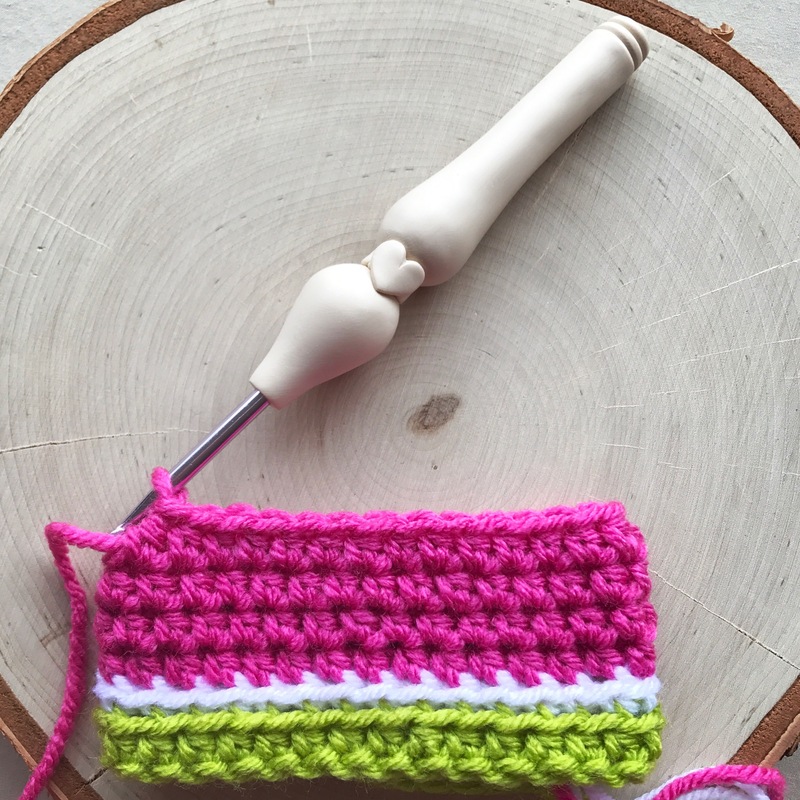 Round 16: Using GREEN yarn, 1 round of SC, BLO (back loop only). Round 17: Using GREEN yarn, complete one round of HDC, BLO, 30 stitches. Carefully apply dots of paint on the red or pink portion of the bow. Allow at least 24 hours to dry. Pinch center of the bow & tie around using the excess yarn to wrap around the nylon headband. Sew in & trim ends. Chain 33 to give the bow a fuller look. You may sell products made from my patterns. 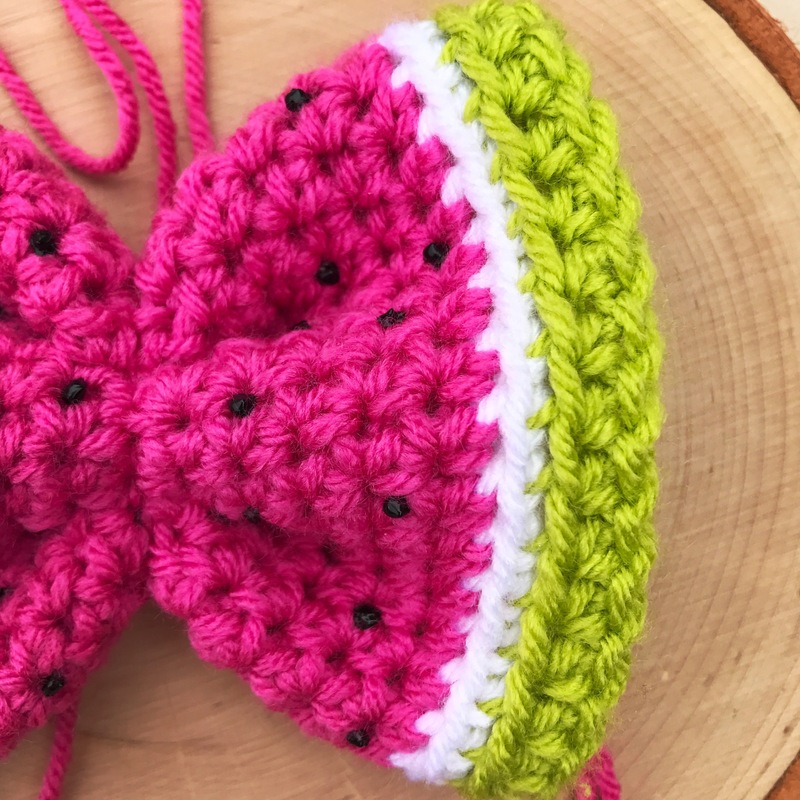 I do ask that you credit my blog on your Etsy/websites as well as on all social media outlets by tagging me on Instagram @southerndaycrochet & on Facebook (Southern Day Crochet). 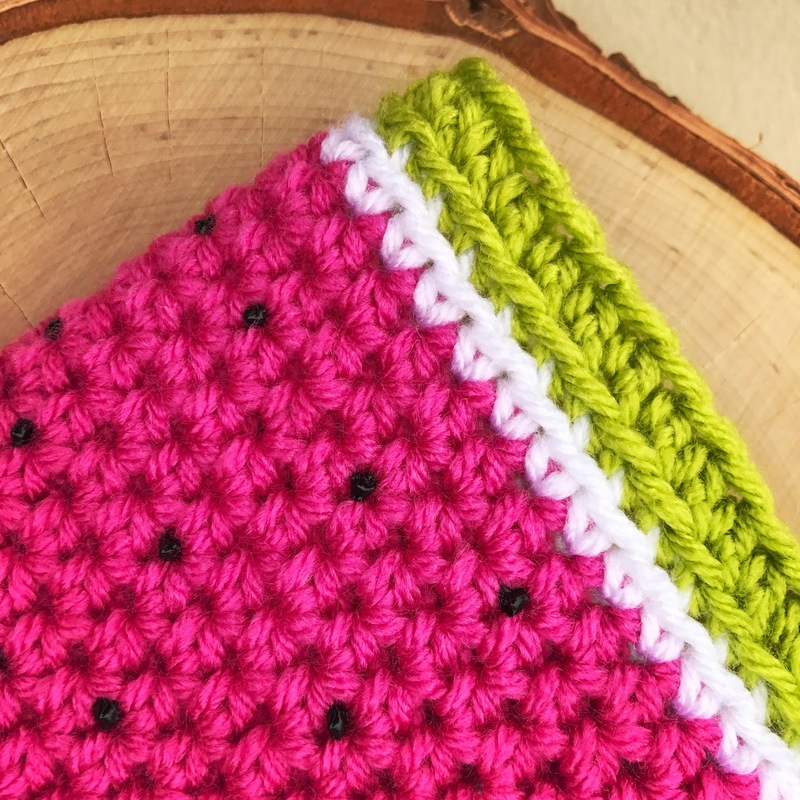 Please use #southerndaycrochet for a chance to be featured on my Instagram! I love seeing your work!! Please contact southerndaycrochet@hotmail.com or comment below with questions. As always, THANK YOU for your support and for checking out this tutorial! 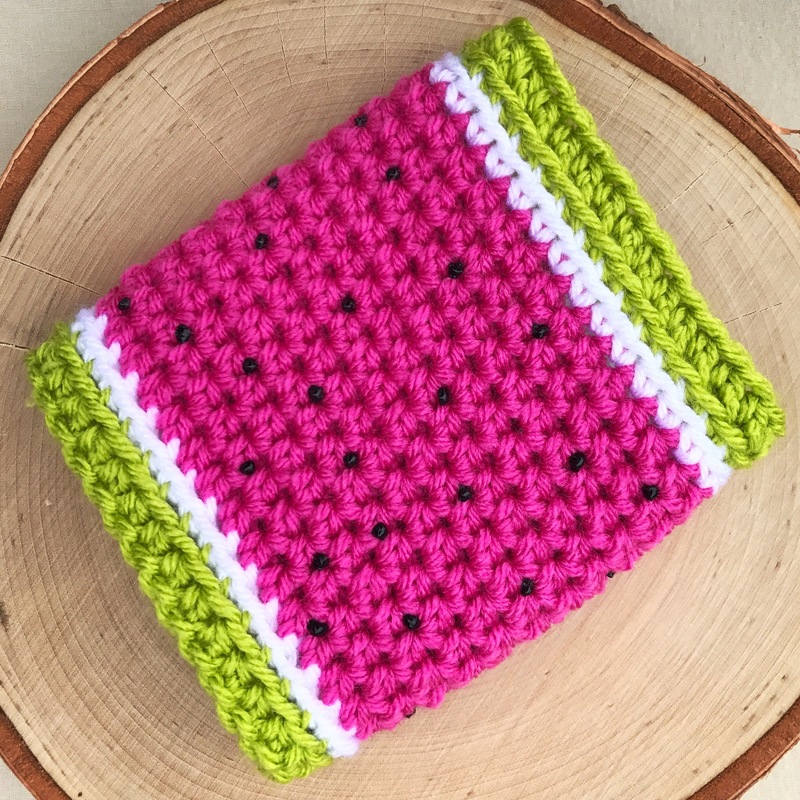 Have a wonderful 🍉 filled Summer!